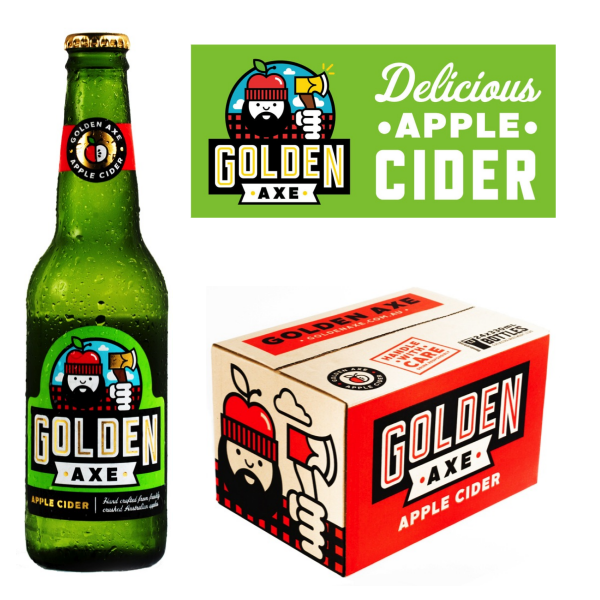 Having launched in October 2012, Golden Axe cider is a Victorian handcrafted apple cider produced using none other than premium Victorian apples. Firstly, I absolutely LOVE the label - a cute little bearded lumberjack man wearing a red check shirt, a red apple beanie, holding a signature axe. The brand was designed by award-winning designer and illustrator Mikey Burton . Made by a group of self proclaimed beverage geeks, this cider is made using only fresh apple and yeast and does not contain any concentrates or added sugar. In terms of taste - it's a very clean, light and refreshing apple flavoured cider. It has a lovely balanced sweetness which I like because it is not sickly sweet like many ciders can be. A light carbonation also works well with this cider as it does not leave you feeling overly full like a bubbly cider can. A crisp, slightly tart finish makes this a great cider for hot summer days. What sets this cider apart is the process in which it is made. The apple juice is not allowed to oxidise and is crafted using a very clean fermentation process. The result is limited yeasty flavours and aroma by products. It's smart and I like it. 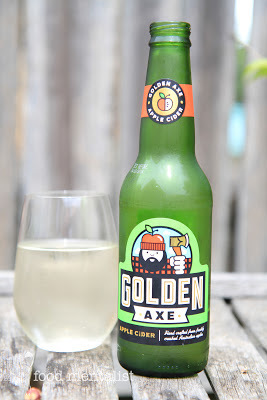 Golden Axe will pair well with fresh summer salads, seafood and grilled meats. At 5.2% alcohol, a 330ml bottle will provide you with 1.3 standard drinks. Golden Axe cider was also the Runaway Winner of People’s Choice Best Cider at the Fed Square Microbreweries Showcase 2012. You can catch Golden Axe Cider at the upcoming Ballarat Beer Festival in January 2013. I also wanted to introduce you all to a great new Oz based Cider exclusive website that I love - It's called the Cider Insider and it stocks a great number of new local and international boutique ciders as well as many trusted old favourites. It's also a great resource for lovers of cider as it keeps up to date with upcoming cider events. Yay! You can check them out here and they stock Golden Axe too! Hope you are all having a great Sunday. Tell me, which ciders are you enjoying today? The Food Mentalist sampled Golden Axe Apple Cider compliments of Cider Insider.